The Lips and POB played “Give Peace a Chance” together, followed by “Happy Xmas (War Is Over)” at midnight – watch at top. For a special encore, the fearless freaks played a John Lennon tribute set: “Strawberry Fields Forever,” “A Day in the Life,” “I Am The Walrus” and a nearly 16 minute version of “I Want You (She’s So Heavy)” with Nels Cline (playing these shows as a Plastic Ono Band member). After repeating the end of the latter to a hypnotic, trance effect, then abruptly stopped and left the stage. They returned for a second encore though, state rock song, “Do You Realize.” Check the full set list and other details here. Almost ever year that they’ve been an active band since 1995 , Phish has played several nights at Madison Square Garden leading up to New Year’s Eve. This year’s four shows from December 28th through 31st were webcast at livephish.com: “a 10-camera, high definition shoot with high quality audio mixed” for $13.50 – including access to the archived show afterwards. Though some “phans” complain this was the least experimental of Phish’s annual NYE at MSG runs, “the community” agrees they brought a party befitting the most festive night of the year. From time-honored opener “AC/DC Bag” to the “Wolfman’s Brother” it segued into, to the “Auld Lang Syne” tease in Trey Anastasio’s “Fluffhead” solo, and finally closer “First Tube” and encore “Slave To The Traffic Light” – they kicked out the jams on the last night of the residency in celebratory mode. As if to drive the point home, Phish opened the second set with “Party Time,” followed by “Light > Golden Age” (TV on the Radio cover). The climax of the evening – musically and otherwise – was “Steam > Auld Lang Syne > Down With Disease.” As the band kinetically grooved on “Steam,” acrobatics emerged, flying over the audience as the 2012 countdown began. Watch the entire extravaganza – ripped from the official webstream – here. While some phans were quick to dismiss the acrobat routine as a “gag,” others viewed it as “a powerful, and philosophically driven skit that delivered the poignant message that we are all eternal souls dancing together forever.” In anycase, both sides tend to agree, in theatrical terms – lighting, balloons and spectacle that is – this was arguably the most impressive show of Phish’s career (the very reason some begrudge it). Phish also chose New Year’s Eve to announce their next archive release: December 31, 1991, a turning point for the band. “Tweezer→ McGrupp And The Watchful Hosemasters” from the upcoming release streams here. Womb organizer and co-owner Rick Sinnett had big plans for New Year’s weekend at his psychedelic art gallery (which he runs with The Flaming Lips’ Wayne Coyne and Jake Harms). Acclaimed “thinking man’s” poster artist Emek was scheduled to kick-off the festivities Friday night with his final Poster + Retrospective & Book Signing of 2011. 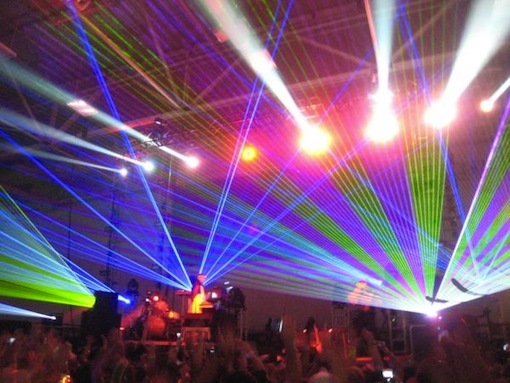 The week-end-long Freak Out festivities were set to culminate with a NYE After Party featuring “electric symphonies until sunrise” by New Fumes and Stardeath and White Dwarfs in the wee first hours of 2012 – open to all of the 1,500 fans at The Flaming Lips/ Plastic Ono Band concert. Though all three of those artists got to do their thing – the exact plans were altered after The Womb got shut down by the OKC Fire Marshall. Stardeath played a “secret show” down the block from the Womb: a jam on Stravinsky. 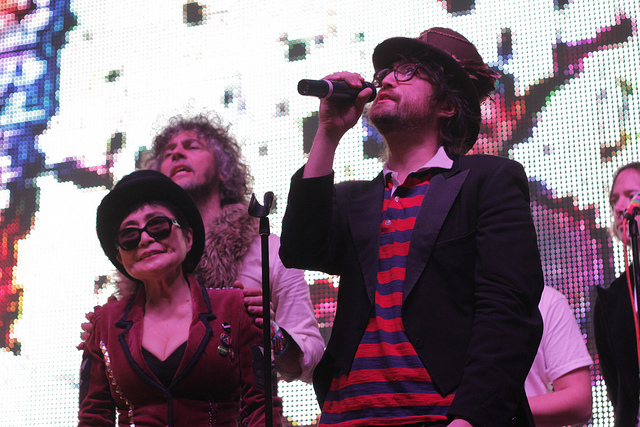 The Polyphonic Spree played a reunion show of sorts at Dallas’ the House of Blues. They brought back members of yore for a full, eccentrically spectacular sound: Joe Butcher on pedal steel, Rick Nelson on orchestral strings, Toby Halbrooks on theremin and Ricky Rasura on harp. Fittingly, they also expanded their set list. Centro-matic opened. Besides Phish at MSG, there’s several NYE gigs NYC has come to expect: a covers-heavy Gov’t Mule run at Beacon Theatre, Chuck Berry at the B.B. 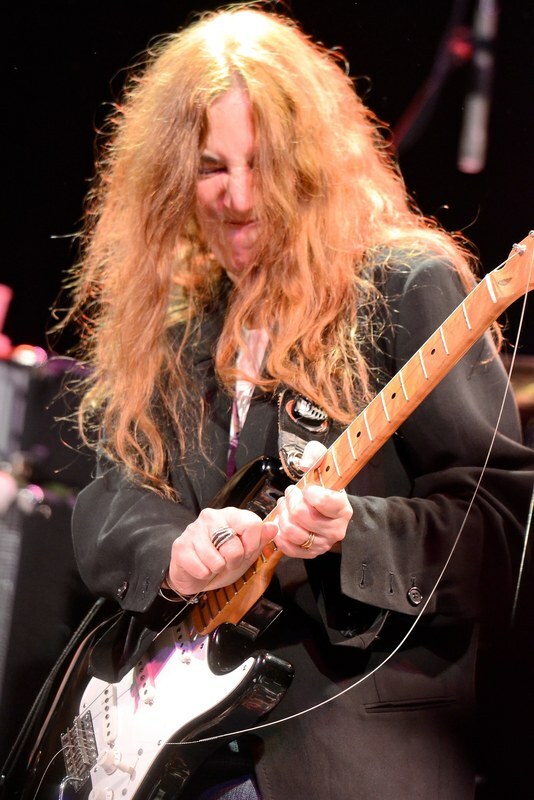 King Blues Club, and Patti Smith at Bowery Ballroom, December 29th through the 31st. 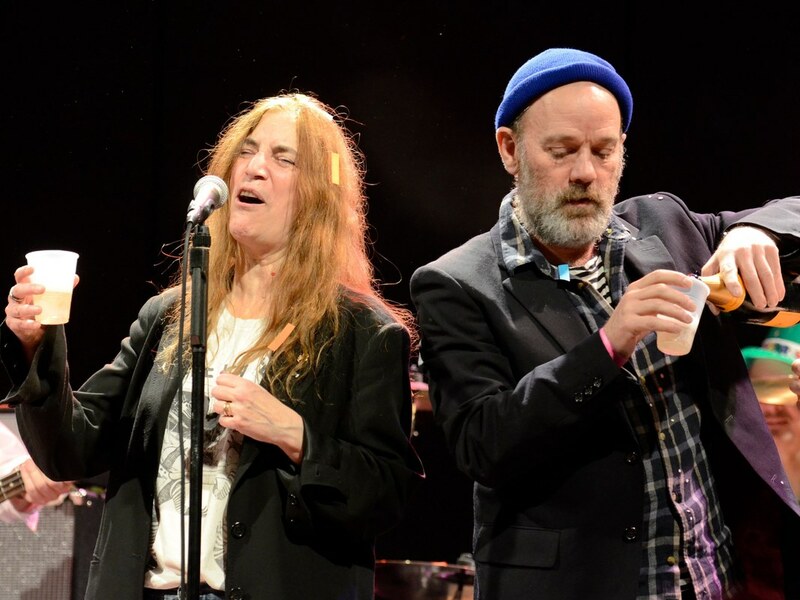 As in year’s past, the final of Patti’s three shows was broadcast on SiriusXM (The Loft – channel 30) and Michael Stipe was in attendance. This year Stipe took the stage with Patti’s band to sing “Wichita Lineman” – which he had previously covered live with REM, and released as 1996’s “Bittersweet Me’s” B-side. In the past few months, viola/ drums acoustic-electronica-rock duo Talkdemonic has brought their music to larger audiences, jammed with Kliph Scurlock and released this breath-taking music video. The Portland group’s October release Ruins – the debut release on Isaac Brock’s Glacial Pace record label – wasn’t just among the most sonically inventive albums of 2011, it was the must-hear album for any and all music freaks who assume it’s all been done. Yep, it was a huge year for Talkdemonic – and they ended it accordingly: with Brock joining them at their NYE show first for the Modest Mousey “Ending The Orange Glow,” and then, in the closing moments of the 2011, with “Revival.” Brock stuck around to kick-off 2012 with his beloved group, covering Fleetwood Mac’s “Dreams”…. Check out the setlist from the show they rang in 2012 with below, or download it here. Watch their Dragon countdown below: huge dragon’s head with red LED lights and smoke blowing out its mouth – built from all recycled cardboard and aluminum… and “Sugar Magnolia” in the first minutes of the 2012. Hear that comment, and the rest of the set here. Vinnie Amico, moe.’s drummer, invited his ninth grader daughter Marley on stage to play the sax solo on Pink Floyd’s “Money” – watch it on YouTube. Click here to read the New Year’s Resolutions and 2012 Wishes of Yoko Ono, Mercury Rev, Dawes, Yuck, Brendan Benson…and Woody Guthrie!